Aroma of Jolly Rancher and SweeTarts. Dark amber hue. Aggressively sweet flavor approaching offensive. Artificial caramel flavor overload. Slaps you in the face with brown sugar. No trace of actual pumpkin flavor or fall spices beyond a trace of cloves. Slightly and unpleasantly syrupy texture. Unfortunately long finish thanks to high sugar and alcohol content. Exhausting on the palette. Aroma: Sweet! Like grandma’s candy dish. Appearance: Reddish-brown hue, low on fizz, like a Scotch post a few rocks. Taste: Huge and hoppy. Devoid of the “coin” taste that most IPAs give. Mouthfeel: Scotch honey, lies on the tongue like a good Sazerac, evaporates quickly, hint of cask ale. Pumpkin: A very sharp, direct sweetness. Not a cloying, sugary sweetness, but more like a Sambuca is sweet. Ingredients: Anise, maple vinegar, the cinnamon cuts through the most where the pumpkin spices are concerned. 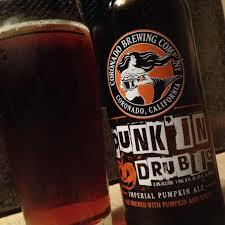 As pumpkin beers go, an intense experience; a beer that is not likely to induce indifference. The closest I’ve ever come to liking a pumpkin beer, and look forward to seeing if my second encounter tips the scales even farther to the positive. After 37 separate pumpkin brews, it would suffice to say that a “sick of” illness could set in. Along comes Coronado with it’s cordial solution – Punk’in Drublic. Now, I’ve been “punk’in drublic” on enough occasions to know my own behavior, and overtly sweet is usually not my dominant trait of choice. However, this amaretto colored ale gives a cloying (the dreaded “C” word”) aroma of sweet pumpkins mingled with cinnamon and syrupy honey on the nose as it’s modus operandi. This ale packs a saccharine Haymaker and wallops with a wall of sweet that eventually allows cloves and a heavy-handed all-spice through the phalanx of brown sugar and honey. Before the biscuity malt fades into West Coast hoppy finish, you have just enough time to realize that you never actually tasted the promised pumpkin.